Chilpotle or Chipotle Hot Sauce Bufalo Hot and spicy, chipotle hot sauce from smoked red jalapenos and spices. (pronounced "chee-POHT-lay"). Buffalo Hot Sauce. A chipotle pepper is a red Jalapeño chile, ripened, dried, and smoked through a special process. Derived from the Aztec word meaning smoke, jalapeños are placed over huge pits and smoke is blown through tunnels running underground. Chipotle Characteristics - A unique warm heat and smoky flavor , chipotles are packed in a red adobo sauce made from lightly seasoned tomato broth. Embasa chipotles are completely shielded from all the elements during processing to produce an exceptional product. Tan - brown, veined and ridged, they are 5-10 cm (2-4 inches) long and 2.5 cm (1 inch) in diameter. Medium-thick fleshed, with a subtle deep rounded heat, they are excellent in sauces, soups, and as a seasoning for meats and stews. Salsa picante Bufalo chipotle, por sus jalapenos rojos ahumados, salsa de tomate y especias. Full of flavor! Spicy, but in a way that is much more satisfying than those other sauces that are just 'burning' sensation with no taste. If you can find it in store, it used to be $0.75-$2, so I was so heartbroken when Walmart no longer carried it! Now it's kind of hard to find :( By far my favorite hot sauce ever. Add this to quesadillas and eggs!!! Love it!! When this stuff disappeared from all my local Krogers, I just about cried. I love it, and use it a lot. A dab (not a dollop) is essential in tuna casserole, great in mac and cheese, yummy in tomato soup or gazpacho, splendid on veggieburgers and fries (I keep a bottle in the car! ), and absolutely KILLER on pizza. Note, though: I really do mean a dab, not a dollop. Not because of the heat, which seems mild to this old chilehead, but because of the flavor, which is mellow but extremely concentrated and quite smoky. Use restraint till you know how much you like. ProsFlavor, flavor, and flavor. No kidding, try it on pizza--you'll thank me! :) And price, which is generally lower in grocery stores than it is here. 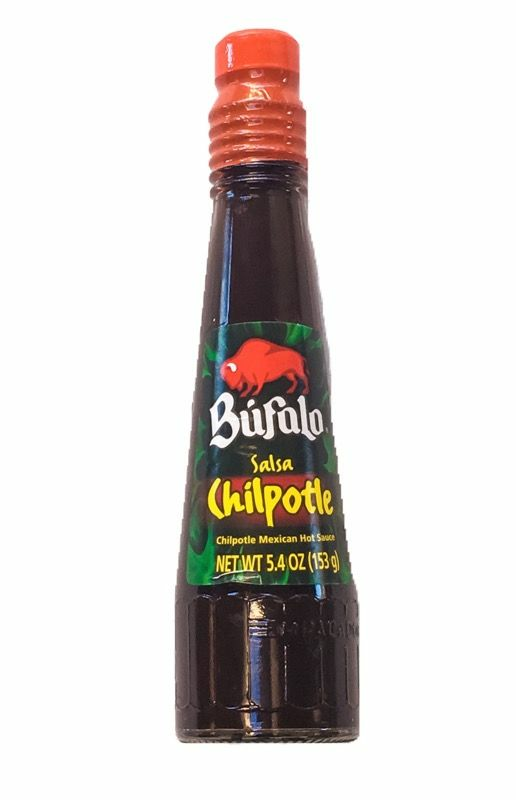 As an avid fan of Bufalo sauces, this Chipotle sauce is by far the best chipotle sauce that I use. ProsMy favorite "go to" chipotle sauce. I make jerky for my family and co-workers. I use this sauce in my marinade and I get rave reviews from everyone. I also use it as an add on for other items. I have to order several bottles at a time since other members of the family enjoy it. Excellent, highly recommended, bought for Christmas gifts, the recipiants love it. I buy this product for a chicken dish I prepare for my son, who loves hot food and it works wonderfully. The flavor is great, it delivers on the heat and makes for a great end product. Really good, not too hot. Nice smoky flavor - great on grilled items! I use it in my maranade for jerky and everyone wants the recipe. Great taste. Great price. I put dry soup mix in a mug and add the hot sauce and boiling water. Refreshing drink. i put it in almost every thing I make. I spread it on both sides of rib-eye's about 30' before broiling them. Creates a great taste that isn't overpowering. Great flavor! I like to pour some over a mex style mashed chick pea/tuna dip I make and serve3 with with tostadas. I love to brush a thin coat on a nice ribeye (both sides) after sprinkling with black pepper & chili powder and then broil it ~ 7' a side... delicious!! smokey chipotle taste, with a spiciness that doesn't linger for too long in your mouth. I have friends that think it's too hot... but I don't feel that way at all. I go through a bottle every one to two weeks, so i've just learned to buy it in bulk. I put this sauce on almost all of my mexican and thai food. Bufalo makes a jalapeno version that is red, which goes great on sandwiches. this is a staple. can't do without it. originally saw and bought it in nyc at a small mexican place. when I went back for more a month later the store had closed. did a google search and found mexgrocer and now I buy it 3-4 bottles at a time. nothing like it. Want to serve your guests the best flank steak they've ever had? Mix Bufalo Chipotle with Adolph's tenderizer, coat the steak and leave it in the fridge for 24 hours, flipping it after 12 hours so gravity helps work the stuff into both sides. This adds flavor and tenderizes the outside two-thirds. Then freeze it for at least 24 hours before thawing. This tenderizes the middle third. Rinse before grilling and spray with olive oil. Result: Amazingly flavorful, moist, tender steak that isn't chewy. Your guests will rave, guaranteed.